Uncontrollable flying objects in orbit are a massive risk for modern space travel, and, due to our dependence on satellites today, it is also a risk to global economy. 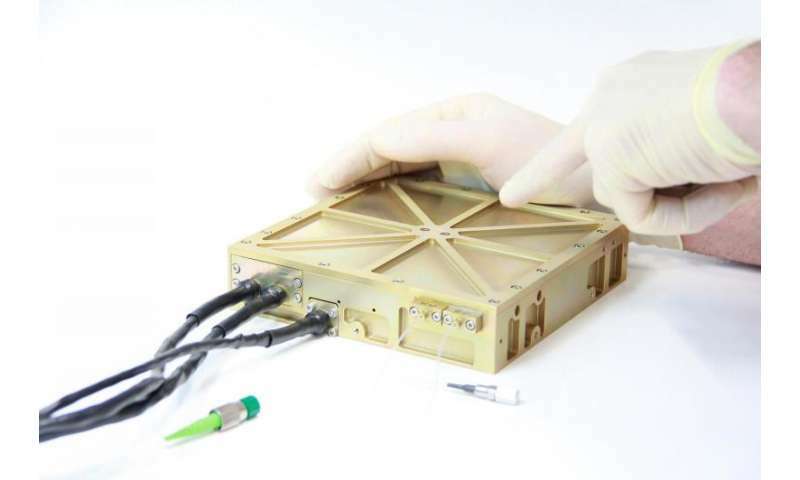 A research team at the Fraunhofer Institute for Applied Optics and Precision Engineering IOF in Jena, Germany, has now especially developed a fiber laser that reliably determines the position and direction of the space debris' movement to mitigate these risks. Today, the global economy depends to a substantial degree on satellites and their functions – these applications are, for example, used in telecommunications, the transmission of TV signals, navigation, weather forecasting and climate research. The damage or destruction of such satellites through a collision with orbiting satellites or remains of rockets can cause immense and lasting damage. Therefore, the hazardous space debris needs to be reliably tracked and recorded before any salvaging or other counter-measures can be considered. Experts from Fraunhofer IOF in Jena have developed a laser system that is perfectly suited for this task. "With our robust and efficient system we can reliably and accurately determine the objects' exact position and direction of movement in orbit," explains Dr. Thomas Schreiber from the fiber lasers group at Fraunhofer IOF. 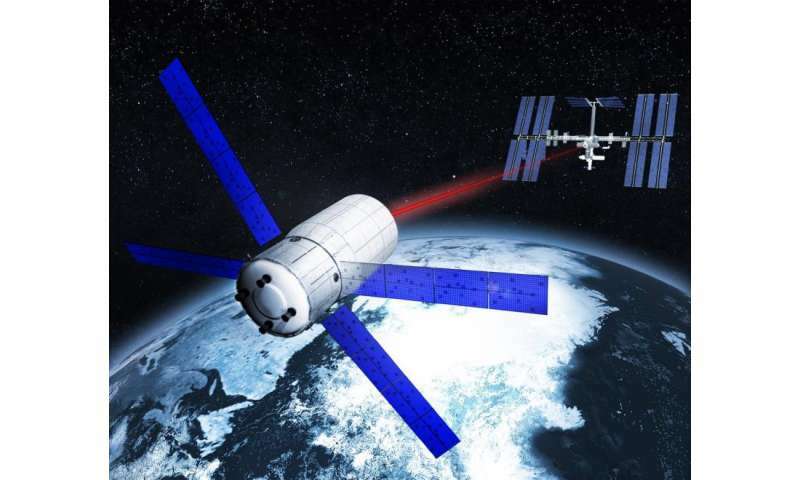 "Laser systems like ours must be exceptionally powerful in order to withstand the extreme conditions in space. In particular, the high physical strain on the carrier rocket during the launch, where the technology is subjected to very strong vibrations. "In the low earth orbit, the high level of exposure to radiation, the extreme temperature fluctuations and the low energy supply are just as great obstacles to overcome. This necessitated the new development by the Jena research team since common laser technologies are not able to cope with these challenges. Moreover, it is also necessary to analyze space debris over comparatively long distances. For this purpose, the laser pulse is propagating through a glass fiber-based amplifier and sent on its kilometers long journey. "Very short laser pulses, which last only a few billionths of a second, are shot at different positions in space to determine the speed, direction of motion and the rotational motion of the objects," explains Dr. Dr. Oliver de Vries. "With our laser system it is possible to shoot up thousands of pulses per second. If an object is actually at one of the positions examined, part of the radiation is reflected back to a special scanner, which is directly integrated into the system. Even though the laser beam is very fast, it takes some time for the emitted light to get to the object and back again. This so-called 'time of flight' can then be converted into a distance and a real 3-D coordinate accordingly." The system's sophisticated sensors, which collect the reflected light reflexes, can detect even billionths of the reflected light. The principle – originally developed by the two researchers of Fraunhofer IOF for Jena-Optronik and the German Aerospace Centre (Deutsches Zentrum für Luft- und Raumfahrt, DLR) – has already been successfully tested during a space transporter's docking maneuver at the International Space Station ISS. Previously, the laser system had been installed in a sensor of the Thuringian aerospace company Jena-Optronik GmbH and was launched in 2016 with the autonomous supply transporter ATV-5. Jena Optronik's system also excels in energy efficiency: the fiber laser operates at a total power of less than 10 watts – that is significantly less than a commercial laptop, for instance.